Although the jobless rate is at its lowest level in five years and the stock market has surpassed its pre-recession high, the economic gains have not reached many poor urban residents, and 2014 could be even worse, a new survey said Wednesday. Homelessness and hunger have increased and are expected to keep rising in many cities next year, according to the latest U.S. Conference of Mayors survey of 25 large and midsized metro areas. Last year’s national poverty rate of 15% is still near the Great Recession’s high of 15.1%, according to U.S. Census figures. 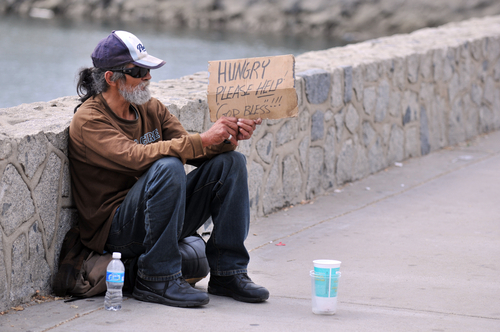 “We anticipated that problems related to unemployment and the slow national recovery would be reflected in the survey cities, and they were,” Santa Barbara Mayor Helene Schneider, a co-chair for the group’s task force on hunger and homelessness, told reporters in a conference call. Officials involved in the urban survey said they were worried about recent cuts to food stamps and by the new congressional budget deal, which does not renew jobless benefits for the long-term unemployed. Those extended benefits will expire after Christmas. “Despite the budget problems we all face, every level of government has got to [focus its resources] on solving these problems,” Schneider said. The 25 surveyed cities, which include Los Angeles, Santa Barbara, Dallas, Chicago, Philadelphia and Washington, reported a 3% increase in overall homelessness, and half of the cities expected the number of homeless families to rise in 2014.